One evening we plonked ourselves down in front of Netflix and scrolled through our nightly options as we waited for the pooches to have their mad half hours and fall asleep. This mainly consists of them biting each other whilst growling, sometimes on the floor, sometimes while jumping on our heads... their tails are wagging, and if I try to stop them they innocently look at me like I've stolen all that is good and light in the world, so, after all these years, we just resolve to sit through it and wait for the calm after the storm. But that's all beside the point. 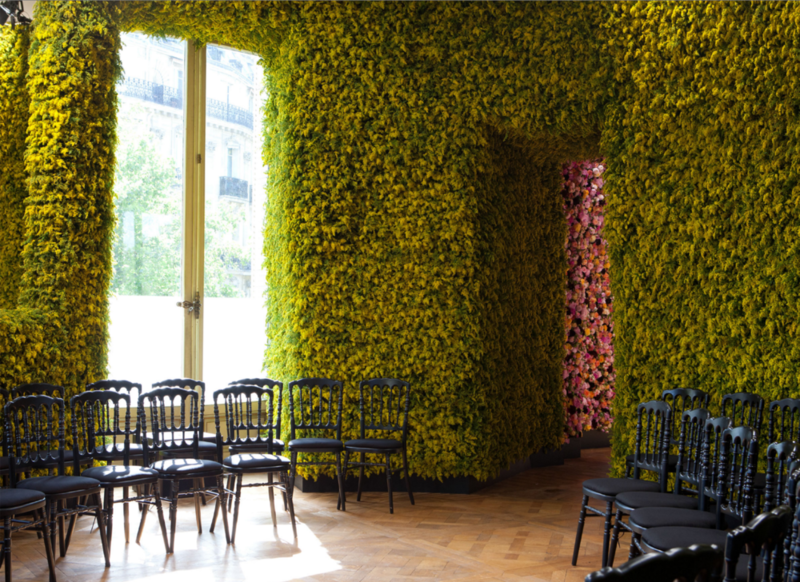 As the runway show draws near, Raf wants to create something unbelievably striking and pitches the idea of a Floral installation to the Director of Dior. He wants to bring on board the Belgian florist Mark Colle to line the walls of a Parisian townhouse (which is unbelievably stunning in it's own right!) where the collection is going to be walked through for the Fashion Show, with flowers. It's a huge undertaking and the budget eye-watering. You watch as every wall, alcove and doorway in the building is completely bathed, blanketed and enswathed with flowers - both mixed blooms for a neon explosion of contrasts and textures, to entire rooms of one colour, one flower, such as delphinium which engulfs the room in cobalt blue... changing hue on each wall, as the light floods in through the enormous windows. It took a team of 50 people four straight days to install the flowers and as I watched it emerge, I cried. It was so unbelievably beautiful, so overwhelming - that flowers could look like that, create that, that people would care so much about them to invest in something like this, both financially and physically... it was just mind-blowingly incredible. Apparently you could smell the scent of the installation for three blocks. I mean, wow. Right? The tear inducing beauty of these flowers, these rooms and how amazing it was, was one of the things that made me realise - that maybe, just maybe - flowers were supposed to be even more important and present in my life than they already were.